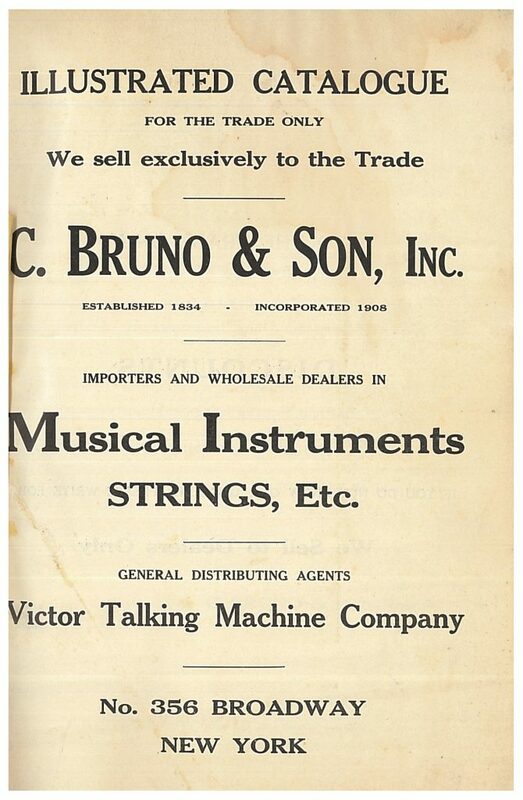 This trade catalog is entitled Illustrated Catalogue…Musical Instruments, Strings, Etc. (1912-1913) by C. Bruno & Son, Inc. It includes a variety of musical instruments and accessories for the musician. C. Bruno & Son, Inc., New York, NY. Illustrated Catalogue…Musical Instruments, Strings, Etc., 1912-1913, front cover. 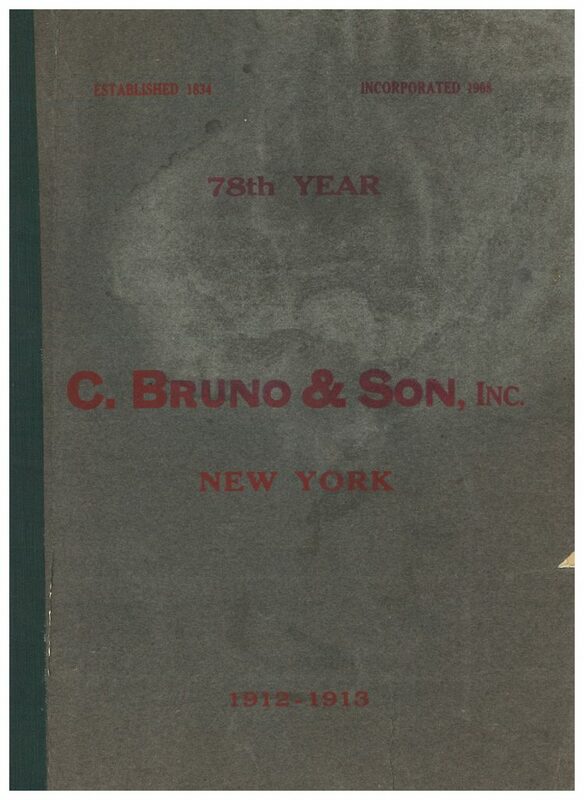 As stated on the title page, C. Bruno & Son, Inc. sold only to the trade. This meant they did not sell directly to the consumer. Therefore, the catalog also includes ideas for displaying products in shop windows or on counters. C. Bruno & Son, Inc., New York, NY. Illustrated Catalogue…Musical Instruments, Strings, Etc., 1912-1913, title page. Two ways of displaying harmonicas are shown below. One idea was to use the Hohner Collapsible Display Cabinet. It was made of wood and finished with dark mahogany piano polish. It held 38 harmonicas of 16 different styles. When the display was closed, it looked like a jewelry box, but once it was opened, it became a three-tier display of harmonicas. C. Bruno & Son, Inc., New York, NY. 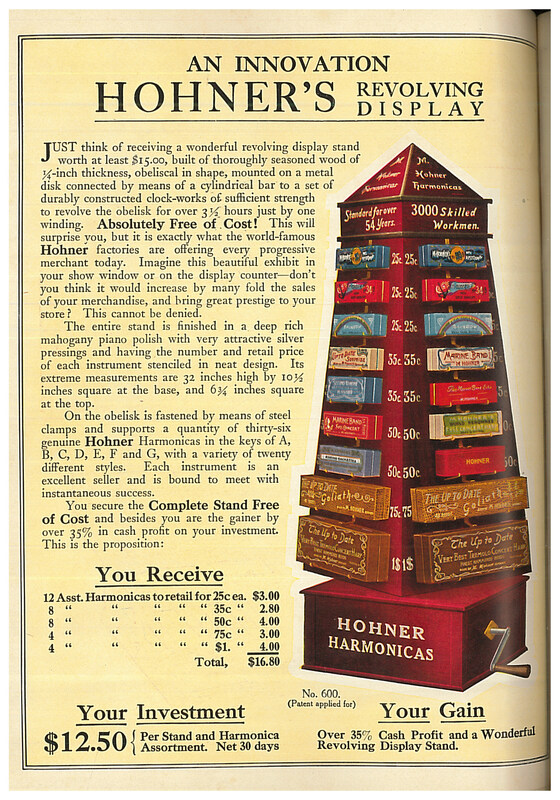 Illustrated Catalogue…Musical Instruments, Strings, Etc., 1912-1913, unnumbered page immediately following page 128, Hohner Collapsible Display Cabinet (closed and open views). Another option was Hohner’s Revolving Display. It was shaped like an obelisk and constructed of wood that was finished in mahogany piano polish. It even revolved on its own. It was mounted on a metal disk connected by a cylindrical bar to clock workings, and it took just one winding to make it revolve for over three and a half hours. 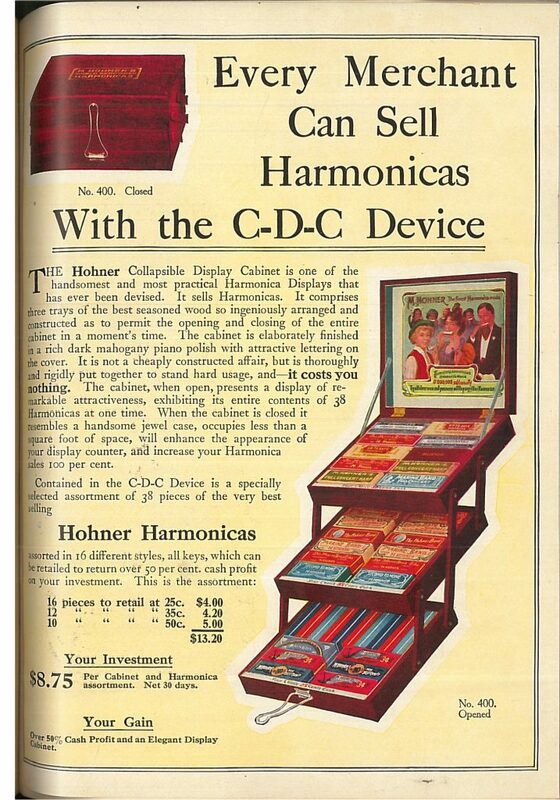 The display had the capacity to hold 36 Hohner Harmonicas of 20 different styles, which were attached by steel clamps and supports. C. Bruno & Son, Inc., New York, NY. Illustrated Catalogue…Musical Instruments, Strings, Etc., 1912-1913, unnumbered page immediately preceding page 129, Hohner’s Revolving Display of Harmonicas. Accessories, like instrument cases, music stands, strings, and picks are also shown in this catalog. Other musical instruments include violins, guitars, drums, accordions, trombones, and much more, including these mandolins. The Bruno Mandolins, below, have extended fingerboards and are decorated. C. Bruno & Son, Inc., New York, NY. 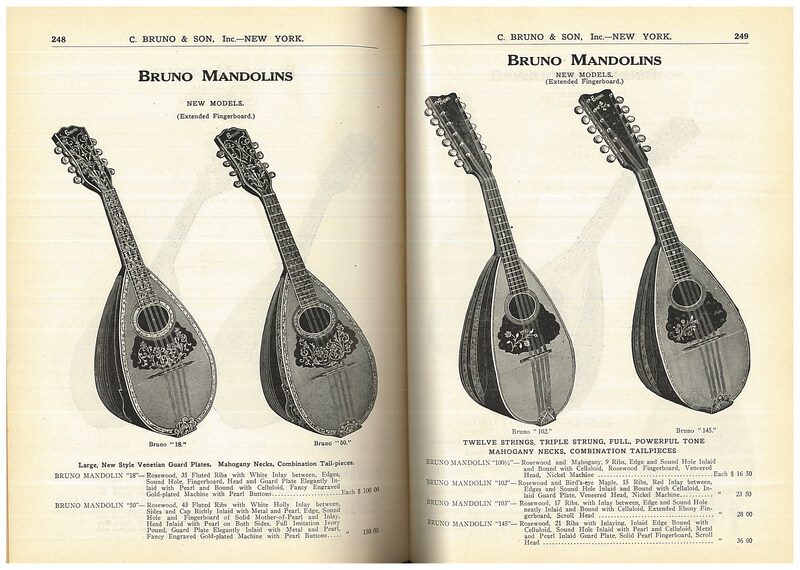 Illustrated Catalogue…Musical Instruments, Strings, Etc., 1912-1913, pages 248-249, Bruno Mandolins. Illustrated Catalogue…Musical Instruments, Strings, Etc. (1912-1913) and other catalogs by C. Bruno & Son, Inc. are located in the Trade Literature Collection at the National Museum of American History Library. Wondering about other music related catalogs in the Trade Literature Collection? Here is a post about Lyon & Healy violins and guitars and another post about marching band uniforms. C. Bruno & Son Inc.